You care about your child’s health. So much so, you may even catch yourself being a little overbearing sometimes. The good news is once you know the steps to managing your child’s oral care, you’ll set them up for a healthy future for many years to come. 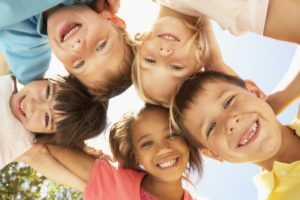 In celebration of Children’s Dental Health Month this February, a dentist in Naples will discuss the most common issues affecting children’s oral health and what you can do to practice proper prevention. When it comes to your child’s health, knowing is half the battle. While many people assume that asthma is the most common chronic issue for America’s youngest, the reality is tooth decay is an even bigger epidemic. According to the Centers for Disease Control and Prevention, tooth decay is the most common chronic disease among children aged 6 to 11 years and adolescents aged 12 to 19. It’s also four times more common than asthma among adolescents aged 14 to 17. How Can This Impact Daily Life? While the ability to chew foods is the most obvious issue facing children with tooth decay, those with cavities are also more likely to miss school. This results in a higher chance of poorer academic performances compared to their peers, not just because they’re missing school, but because they’re also distracted by persistent tooth pain. Furthermore, the National Education Association notes that school-aged children and youth miss 51 million hours school of each year due to oral health problems. They also note that children afflicted with oral health issues are four times more likely to have lower GPAs than their peers that don’t. Thankfully, you can prevent dental caries in your child by taking the necessary steps to protect their oral health. As a result, you improve their chances for success in school, which is especially important during their formidable years. Take note of the following steps and your child will be on their way to better oral health! Have you scheduled your child’s next dental appointment? Getting them scheduled can dramatically reduce their risk for cavities in the future! Dr. Mark Makram earned his DDS degree from the State University of New York at Buffalo School Dental Medicine. He provides quality dental therapies and treatments that ensure your child’s oral health future is positive throughout their development. To learn more about his preventive treatments, you can contact him through his website.